Preventing and getting rid of kidney stones is a complex issue because there are different causes and types. However, the short answer is that I believe the best drinking water for all types of kidney stones is filtered mineral water or alkaline ionized water. To explain why I say this, we need to have a basic understanding of the different causes and types of kidney stones. Kidney stones do not have a single, definite cause. However, there are known factors that can increase your risk of developing them. Understanding the reason why your urine may contain more crystal-forming substances than it can dilute is essential for prevention. Please note the keyword here is “balance.” People with calcium stones tend to assume this means they need to reduce their intake of calcium in their diet. However, many patients with calcium stones have normal urinary calcium levels. For these people, reducing dietary calcium may actually cause an increase in oxalate and thus more stone formation. Dehydration. First and foremost, the primary cause of urine imbalance is caused from not drinking enough water on a daily basis to stay fully hydrated. When the body is lacking water, the minerals, salts and other substances in urine will bond together and potentially form stones. Drinking Low Mineral Water. Drinking demineralized water (i.e., reverse osmosis and distilled) can create imbalances in the urine. Drinking demineralized or low mineral water has a negative impact on specific functions in the body that control water and mineral metabolism. According to a comprehensive study by the World Health Organization, drinking demineralized water creates an imbalance in the body, causing the body to increase urine output, and thus the additional loss of magnesium, potassium, calcium and chloride ions. Diet. Eating too much animal protein and dairy, processed and fried foods, and consuming too much sugar and starch will create an overly acidic condition in the body. People have varying levels of tolerances to these foods but eating them will eventually create numerous imbalances, including undesirable changes in the kidneys and urine. Medical conditions. Less common reasons for imbalances in the urine can be due to certain medical conditions, such as gout, inflammatory bowel diseases, such as Crohn’s or colitis. In rare cases, the parathyroid gland can produce too much of a certain hormone that increases calcium levels and potentially calcium stones. Calcium stones. These are the most common type and are formed when calcium combines with other substances, such as oxalate or phosphate. High doses of vitamin D, poor diet, and several metabolic disorders can increase the concentration of calcium or oxalate in urine. Uric acid stones. These stones are believed to be caused by too much acid in the urine. There are many reasons for this including, excess animal protein, including dairy foods and beverages, alcohol, as well as fried, canned and processed foods. Struvite stones. These form after a urinary tract infection. They can grow large quickly with little warning. Many urinary tract infections are caused by an imbalance in the body pH. Eating more of a plant-based diet will help to alkalize the body. Cystine stones. These are rare and they often run in families. The cause seems to be undetermined, except perhaps a genetic weakness. The general dietary guideline for any type of stone formation is to increase water intake and to avoid excess salt and animal protein. However, you should consult with your doctor before making any dietary changes since there may be other factors to consider. I believe ionized alkaline water or any mineral-rich water is the best drinking water for anyone who is prone to kidney stones. My second choice is filtered water that contains the natural occurring minerals in water. I recommend using a home drinking water filtration system rather than buying bottled mineral or spring water. Some bottled waters are ok, except you never really know what you are getting because bottled water regulation is minimal. An EPA study several years ago found that nearly 40% of all bottled water was reprocessed tap water, usually with just some type of disinfectant added such as chlorine. Nothing has really changed since that study was conducted. I would also avoid drinking distilled water or reverse osmosis water for more than a week or two at a time. Since these waters are demineralized, I believe they can contribute to imbalances in the kidneys and urine. 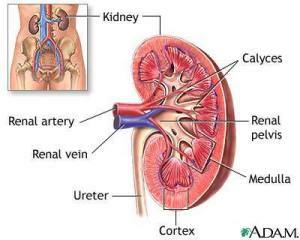 Drinking enough filtered water on a daily basis is the best way to to prevent kidney stones.